Arizona Sheriff’s organizations have released statements about border security. The first statement was released on January 9, 2019 by the Southwest Border Sheriff’s Coalition. The SBSC consists of 31 Border Sheriffs and counties from Arizona, California, New Mexico and Texas. As the chief law enforcement officers in our respective counties, we have witnessed the societal costs of the lack of border security. We have heard political leaders of all stripes talk about securing the border with little consequence. Today, many portions of our border with Mexico are not secure in any meaningful way. Our Ports of Entry lack the staffing and technology necessary to be effective deterrents to transnational crime. Equally problematic is allowing such a significant issue to be mired in endless political debate and partisan divide. It is time, past time, to move forward with meaningful border security. There are three unimpeachable reasons that without respect to political ideology we should embrace in support of the need to immediately secure our border with Mexico. They are public safety, national security and human rights. Public Safety: The lack of a secure border presents a public safety problem, not only for our counties but also for our nation. The porous border is exploited by transnational criminal organizations to engage in drug and human trafficking. We have a public health crisis in respect to illicit drug use that is leading to overdose deaths and lifetime addiction. The public safety threat of drug trafficking is significant and the societal costs are staggering. Human traffickers exploit migrants criminally, sexually, and financially. 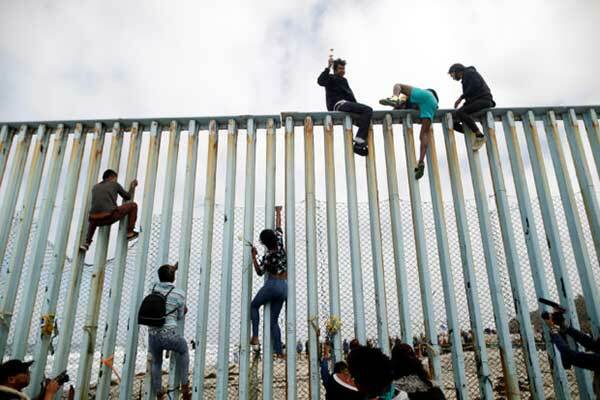 Criminals and gang members posing as migrants can and do use the lack of border security to enter our country to further their criminal behavior. We have ample evidence of this occurring. The lack of a secure border is an undeniable public safety crisis. National Security: We simply do not know who is coming across our border. We know there are bad actors from hostile nations that wish us harm. This is not a political statement, but rather a factual one. The lack of border security can be leveraged by those wishing us harm to come into our country undetected. The lack of border security is an undeniable national security concern. Human Rights: Encouraging migrants to make the dangerous journey to our border and then attempt to cross into remote areas of our country is not compassionate public policy. Southwest border deputies recover hundreds of bodies a year in remote areas of our counties. Migrants die due to the harsh environment or at the hands of alien smugglers. Many walk hundreds of miles from Central America, some with children in tow, to get to the border in hope of a better life. They are led to believe they can simply walk into the United States. This leads to human rights issues along the border and even deaths. People in many parts of the world face desperate conditions Americans can hardly imagine. They seek a better life for themselves and their families. A secure border, along with more sensible legal immigration policies, would dissuade this dangerous and often deadly behavior. The lack of border security is an undeniable human rights issue. Sheriffs have been, and will remain, consistent in their stance on border security. Let us reiterate and be absolutely clear, we need to secure our southern border with Mexico immediately for public safety, national security and human rights. There has been much focus on “The Wall.” The term “The Wall” has become synonymous with border security. This term has become a lightning rod of division that has detracted, more than added, to thoughtful approaches to securing our border. “The Wall” is a soundbite, not a cogent public policy position. The U.S./Mexico border is nearly 2000 linear miles. It presents topography, environmental and land use challenges to what might be considered a traditional wall. There are mountains, waterways, Native American Reservations and environmentally sensitive areas where traditional physical barriers will be difficult, if not impossible, to construct. Some areas are very remote and lack the supporting infrastructure to facilitate a massive construction project of this scale. Even if properly funded and enjoying widespread public support, it would take many years to construct a wall across the entire border with Mexico. We cannot wait for years and be hostage to the future whims of subsequent political leadership to secure our border. The time is now. There are many places where physical barriers make sense and are in fact the best solution to securing the border. They should be constructed without delay. In other locations, we need to turn to technology, which thanks to modern advances, is robust and effective. In other areas, we need more human resources to ensure security. Likely, in all locations, we will need some blend of physical barriers, technology, and human resources to be successful. The ultimate goal of these efforts should be the complete and total operational security of our southern border. Endless debate about what constitutes a “wall” and who pays for it does little to advance much-needed border security. As we discuss border security, we need to remember the importance of addressing our Ports of Entry (POE). POEs are not being discussed enough and are a major vulnerability. We have to ensure security while still supporting the effective flow of legitimate transnational commerce. Commerce with Mexico through the POEs is vital to the economy of the United States and pumps billions into our economy. Allowing citizens the ability to cross into the United States to engage in legitimate commerce is also vital to the economy of border regions. The POEs need better staffing and technology to support the efficient blow of legitimate transnational commerce while having the ability to detect and interdict illegitimate/criminal transnational activity. We should not let partisan politics stand in the way of securing the border. It is clear we have done so for many decades and through several administrations. We need to secure the border for public safety, national security and human rights reasons. The mechanism of how this is done is far less important to Sheriffs than getting it done. The idea that a wall is the only solution because it is permanent is misguided. A wall that is not monitored, enforced or maintained is only an impediment, not real security. We support the increased attention given to the border and welcome additional federal resources to handle the immigration situation. However, Sheriffs neither have the capacity to engage in proactive enforcement of federal immigration laws nor is it the responsibility of local law enforcement to engage in the enforcement of federal immigration violations. Federal authorities best address these violations of federal law. That being stated, Sheriffs are committed to cooperation and collaboration with all our federal law enforcement partners. We value these relationships with our federal partners and we remain steadfast in working together for the safety and security of our citizens that we serve. Sheriffs fully support efforts to secure our border. Moreover, we demand action on this issue. There are compelling and undeniable reasons to do so. We need to move forward and secure our border immediately. The investment made in doing so will be returned many times over in reduced crime, reduced illegal drug use and a reduction of other societal and humanitarian costs. Sheriffs are committed to providing the highest level of public safety services to all people of our counties. We proactively attack crime problems and criminal behavior without regard to the immigration status of the criminals involved and will continue to do so. Our nation’s Sheriffs are literally on the frontline of the crisis on our border. To suggest there is not a crisis is to be intellectually dishonest. The crisis is neither new, nor manufactured. Sheriffs know this because we have been addressing it for decades. We have been impacted by the public safety crisis in witnessing safety in our communities being eroded by drug trafficking, overdoses, and transnational criminal organizations. Like all thoughtful Americans, we are concerned about the national security nexus to the lack of border security. We do not know who is coming across the border. In the age of international terrorism, this is a clear national security concern. The crisis is real and our nation’s Sheriffs stand together every day, as your elected public safety professionals, to meet this crisis. Sheriffs need to be heard as part of our nation’s address of how to handle this crisis. Between us, we have hundreds of years of experience handling public safety issues related to border security and illegal immigration in our counties. Too often, Sheriffs have not been heard or effectively consulted. That is a lost opportunity to bring the real experts to the table. This is especially true of the 31 border Sheriffs and those Sheriffs in the western United States most directly impacted by the crisis. We are strong, practical leaders not guided by political partisanship or concern over who wins the gamesmanship of political rhetoric. We are guided by a firm commitment to public safety in our respective counties. We need to be heard not as a gratuitous effort, but rather as thoughtful consultation of elected officials entrusted by our citizens to address these complex issues. We have been keeping our counties safe for decades. The Arizona Sheriffs’ Association endorses and supports the position on border security and immigration adopted by the Southwest Border Sheriffs’ Coalition. This is sensible, nonpartisan and will help guide us forward. We hope that the leaders in Washington, DC, of all political parties, hear us and listen to the experts who proudly serve on the frontline of this crisis. As always, Arizona’s Sheriffs welcome a constructive discussion with our national elected officials.